We had a very impressive system for our March 2014 club meeting, an Audio Note UK system nudging up on the $400K mark. The attention to detail was quite amazing in this system; the wiring was neat, organised and engineered for the shortest path; the parts quality was extremely high ($3000 for a capacitor! ); the tubes/valves had special noise reducing pads on the top; the valves were all of very high quality, etc. Bryan Fletcher of Finn Bespoke Technology Pty Ltd, the Australian distributor for Audio Note UK, presented this wonderful system. Upon his arrival, Bryan spent a full hour setting up the system, and then another 45 minutes or so tweaking the system to get the best possible sound. We have a large room and the Ongaku amplifier delivered only 20 wpc, so driving the room to reasonable volumes was bound to be a bit of an issue even though the speakers were very sensitive and the nominal impedance was not too punishingly low. To compensate, he erected upright tables on both sides of the speakers to effectively try to reduce the size of the room that the speakers saw. I was quite amazed by the care and attention to detail on display! When asked about why and how Audio Note design something, the answer always suggested a complete and unfailingly knowledge. Colour me impressed! 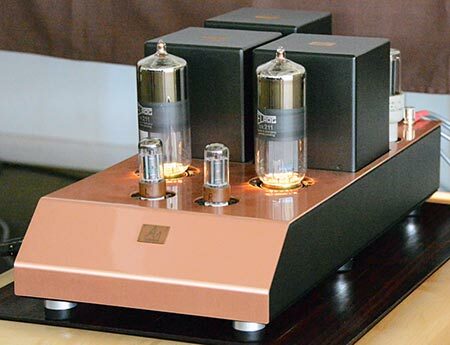 Audio Note Ongaku Kensei Stereo power amplifier with ELROG 211 Tubes and Sogon LX-96 Speaker cable. The Ongaku Kensei is a fairly new addition (January 2012). It’s based on the Ongaku Integrated, but has no preamp section and has a very high quality balanced input instead. 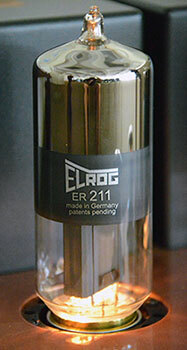 The new manufacture of these German made ELROG 211 tubes are a minor miracle in themselves, refer to http://www.audionote.com.au/NEW_-_Elrog_Tubes.html. Bryan is quite a likeable character with a great sense of humour – he says he’s known as a grumpy old fellow, but if that’s true we certainly didn’t see that side of him! He was very friendly, patient, helpful and willingly explained all the equipment and the Audio Note philosophy, and politely answered all questions. 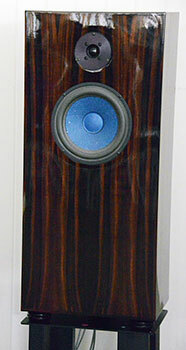 This was a lovely sounding system. It was a warm and inviting sound. The system provided Redbook CD only, but there was no digititis to be heard anywhere. Due to the large room and the low amplifier power, there were always going to be a few moments when it sounded like the music couldn’t really flow out into the room. So yes, we did hear a bit of distortion at times when the volume was higher, but very little. As well, the system struggled to flow the music out into the back rows of the seating – it did sound best in the first few rows. But if you were sitting front and centre, you did indeed get the impression the artists were in the room playing for you. The sound was sweet with very good transparency and detail. It had excellent timbre control and very good cohesion and continuity across the frequencies. At times I did think the bass was a bit plummy but that was likely the low powered amplifier struggling with the large room. In an average sized home listening room, it would sound much better controlled. In fact, everything would have probably sound better in an average sized home listening room. The presentation of this system was the antithesis of the usual monster amp solid state sound – however that doesn’t mean I thought this system sounded soft and fuzzy and uncontrolled, it certainly didn’t. The music sounded refined and defined, vivid and as one piece. My impression on the day was that the gear was excellently suited to all forms of music except perhaps the likes of ACDC, Black Sabbath or the like – you get the idea. I’m keen to visit Bryan in his showroom and home in Croydon to hear what the system is truly capable of. And I’ll take my Black Sabbath to test my theory – I’m happy to be wrong! Somehow, I wouldn’t be surprised if ‘Iron Man’ sounds great. We then had our member’s music segment which was hosted by David Minarik this month. David presented a variety of great music on CD. At the end of the day, I had many people tell me how much they loved the sound, not to mention the appearance of the system. And the feedback forms were flattering all round. The thanks from people was great to hear and read. I don’t have bags of money to spend on an Audio Note UK system and even if I did I’d likely pay off some existing bills instead of creating new ones, but that’s just me and my approaching retirement talking. Having said that, I certainly couldn’t (and wouldn’t!) fault someone for going down the Audio Note route. If you upgrade slowly over time then it lessens the financial pain – I suspect that’s how many audiophiles get into Audio Note gear. So unless you have really strong willpower and can resist spending such money, I suggest you don’t go to visit Bryan at his showroom! If you do go down such a route, however, your life will indeed be filled with beautiful music. Thanks Bryan! Thank you Bryan for all your effort. It all sounded great! An impressive sounding system. Gorgeous to look at and listen to. Enjoyable meeting, clarity was amazing. Good system but not worth it's price tag. Speakers could be better. Lacked bass control and lacked imaging. ad to be in the front row to hear this system as its best.